CCA Kids Blog: Every Kid Needs a Hero! Today is my son Peter’s 12th birthday, and I’m so very proud of the young man he is! The best birthday present he's received is the national recognition and acceptance that R.J. Palacio’s debut novel, Wonder, is giving to kids like him. Every kid needs a hero to inspire them, and I want to thank Ms. Palacio for creating one for my son. 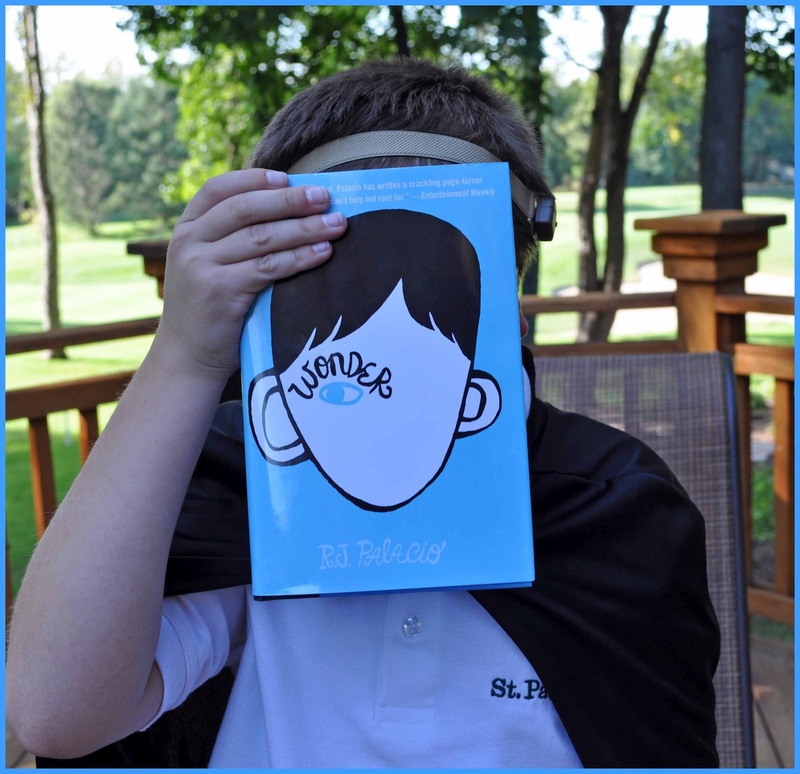 If you have read Wonder, I think you will agree that the main character, Auggie, is a hero that everyone can fall in love with. 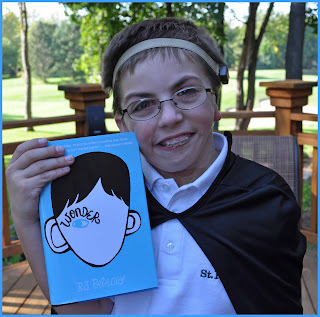 For a 12-year old boy with a craniofacial syndrome, however, there are simply no words for what it feels like to have kids around the country reading this book and cheering for Auggie. This book has given my son and the craniofacial community something we have always desired: for people to look beyond our children’s faces and get to know them for who they really are. 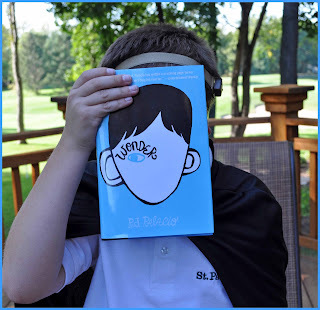 Peter loves this book and wants all his friends to read it so they will, “understand me better.” For the #WONDERschools Blog Tour, we thought it would be fun to give classrooms around the country a real-life comparison to Auggie. Look at the picture of Peter and see if you can identify at least five things that remind you of “Auggie”. They are both boys about the same age. They both attend a private school. They both have a dog. They both have a hearing aid device. They both have ear-related birth defects. Peter wears a prosthetic ear, which he placed on the book cover in this photo. They have many other similarities that aren’t depicted in the photo. Here are just a few you might want to discuss. They both had trachs to help them breathe. They both have one sibling. They have very close birthdays. Peter’s is October 7th. Do you know when Auggie’s is? They have both been Boba Fett for Halloween. They both love video games! They both have difficulty chewing and swallowing (Peter still has a feeding tube). They have both had over 20 surgeries. Peter has had 25. Do you know how many Auggie had? They both feel most comfortable at home with their family. They both use humor to handle their differences. We have a lot of ear jokes in our family! Peter has a younger brother while Auggie has an older sister. Peter’s parents knew a little bit about his birth defects before he was born. Do you remember Auggie’s birth story? Peter never hid behind a space helmet, but he can understand why Auggie did. Peter likes to hold the cover of Wonder in front of his face. Peter has never had a standing ovation—yet! Always remember to “Choose Kind”. If you want to send Peter a birthday wish, please donate to Children’s Craniofacial Association by visiting his fundraising page at www.firstgiving.com/fundraiser/petesoktoberfest2. Dede's family lives in metro Detroit where they enjoy cheering on the Detroit Tigers and Detroit Red Wings. She has two rowdy boys ages 12 and 7, two crazy dogs, and one dedicated husband. Peter was born premature with Goldenhar Syndrome. He spent his first 3 1/2 months in NICU and came home from the hospital with a trach, feeding tube, oxygen, and lots of machines! Jacob is four years younger and is unaffected. He enjoys playing hockey and winning at anything he deems a competition, which is basically everything. 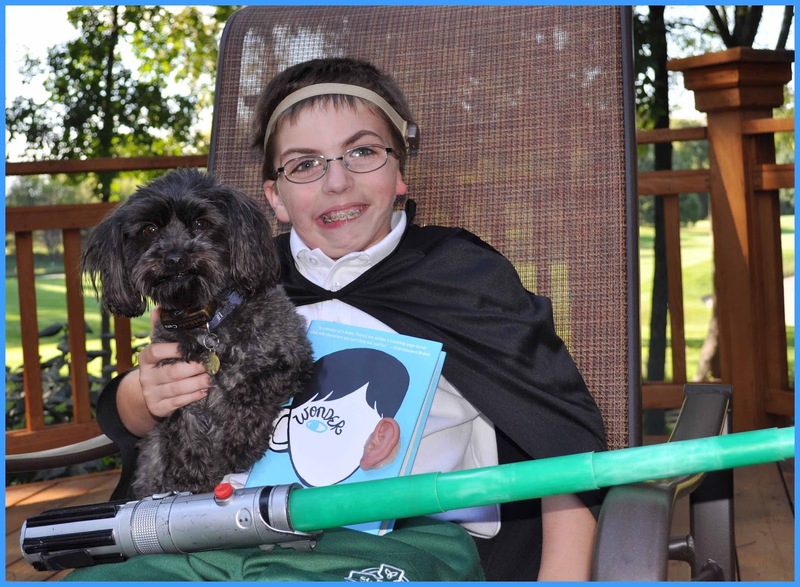 Peter is an avid reader, a walking encyclopedia of Star Wars, and a fan of playing jokes with his prosthetic ear. Dede is a family-faculty speaker at children's hospitals and serves on the Board of Directors for Children's Craniofacial Association. Follow her on Twitter @ddankelson. Happy Birthday, Peter! You are so funny!!! Your ear on the book cover is a hoot! We are reading Wonder right now, too. I have shared one article about you with my sixth grade students. I can't wait to show them this post and tell them your birthday was today! YOU inspire US, Peter. Thank you for sharing your story with us! Peter- You are an inspiration!! Thank you for sharing your story. I will be teaching Wonder this year to my class and your friend Lentil will be our special visitor!! Hope you have a great school year. I am reading Wonder right now! You must be brave! If I had all the money in the world I would donate it to you! Thank you Peter, God bless you. Peter HAPPY B-DAY everyone loves you and we pray for you. DONT BE UPSET CAUSE OF HOW YOU LOOK BE HAPPY AND STAY PROUD OF WHO YOU ARE AND THAT YOU ARE ALIVE. PLEASE STAY HAPPY AND ILL STAY HAPPY!!!!!!!!!!!!!!!!!!!!!!!!!! !